Harvard University Press, Cambridge, 1965. 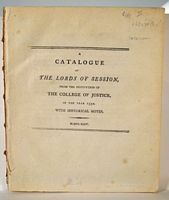 The first revision, significantly expanded, of the first effort to provide biographical detail of the Scots judiciary, undertaken by Lord Hailes, advisor to James Boswell and to whom Dr. Johnson is said to have turned "on any matter of Scottish law"
Little, Brown and Company, Boston, 1967. Charles Scribner's Sons, New York, 1934. Doubleday and Company, Garden City, 1962. Saint Louis University Law Journal, St. Louis, 1969. Edward Thomson Co., Long Island, 1894-99. Little, Brown and Company, Boston, 1944. Charles Scribner's Sons, New York, 1932. Longman, Brown, Green, and Longmans [and] John Murray, London, 1848-64. J. B. Lippincott Company, Philadelphia, 1963. Oxford University Press, London, n.d.. 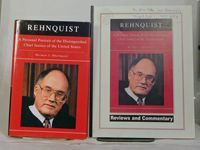 Still the principal biographical source for the study of the English judiciary, distilled and expanded from Foss's 'Judges of England', a work Holdsworth termed "of the greatest value to legal historians, principally for the biographies"
The Bobbs-Merrill Company, Inc., Indianapolis, 1960. Cambridge University Press, Cambridge, 1932. Printed by Order of the Masters of the Bench . . . Inner Temple, London], 1939. Printed for J. Worrall, at the Dove . . . near Lincoln's-Inn, London, 1739. The expansion of Dugdale's listings of the chancellors, judges, law officers, king's serjeants and other officials, thus extending (in Holdsworth's words) "a very valuable piece of work, which, for all time, will be useful to legal historians"
Printed by the Appointment of the Family [etc. ], London, 1734. John Murray, Albemarle Street, London, 1870. Andrew Dakers Limited, London, 1949. Geoffrey Cumberlege [for the British Academy], London, n.d..
Harvard University Press, Cambridge, 1971. Oxford University Press, New York, 1994. John Murray, Albemarle Street, London, 1846-69. Harper and Brothers, New York, 1861. Printed for R. Main, in Dame-Street, Dublin, 1753. Printed by J. Holl; (for the author.) And sold by J. Bew [etc. ], Worcester, 1791. University of Alabama Press, Tuscaloosa, 2010. A work examining the lives of seven "Bourbon Reformers", all but one in the Whig reform tradition of 19th and early 20th century Alabama, discussing both their influence and their limitations-and the role of law-in a "complex, often ambiguous world"
Adam & Charles Black, London, 1965. Lea and Blanchard, Philadelphia, 1847-48. William Edwin Rudge, New York, 1924. Whittlesey House, McGraw-Hill Book Company, Inc., New York, 1939. G.P. Putnam's Son, New York, 1980. Threshold Editions, New York, 2009. Brown, Shattuck, and Company, Booksellers to the University, Cambridge, 1833. Edward Thomson Co., Northport, 1894-99. Estes & Lauriat, Opposite Old South, Boston, 1870's?]. Your search request for "biography" has matched more than 50 records. (102 books matched.) If you would like to see more than 50 records, you can adjust this parameter and resubmit your search.